Lyrical scenes” Tschaikovsky called his 1887 opera, after it was criticized for its supposedly weak plot. But what I experienced was anything but weak. 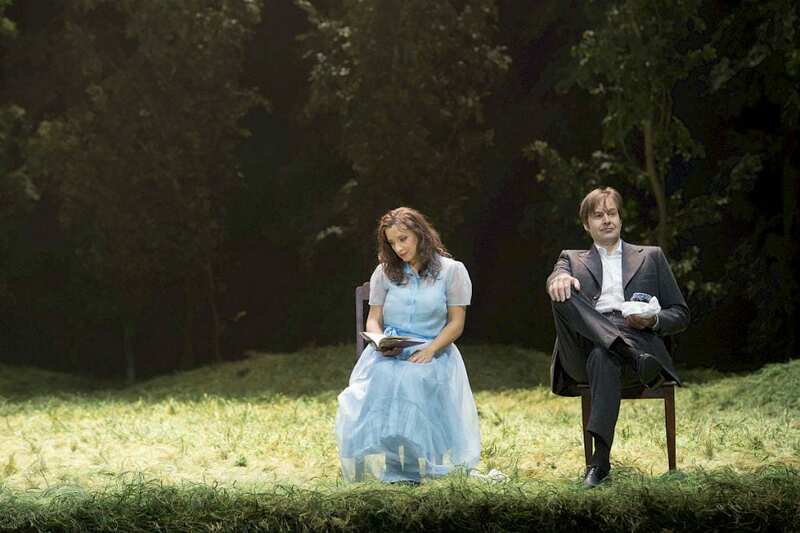 The Zurich Opera opened its season with a true musical and scenic masterpiece. This demands a director willing to identify with the characters and a cast able to show the mental state of their characters without exaggeration, so all the little actions don’t lose their power. The whole focus of the evening is on the characters and their feelings. The character of Tatjana is a true introvert. 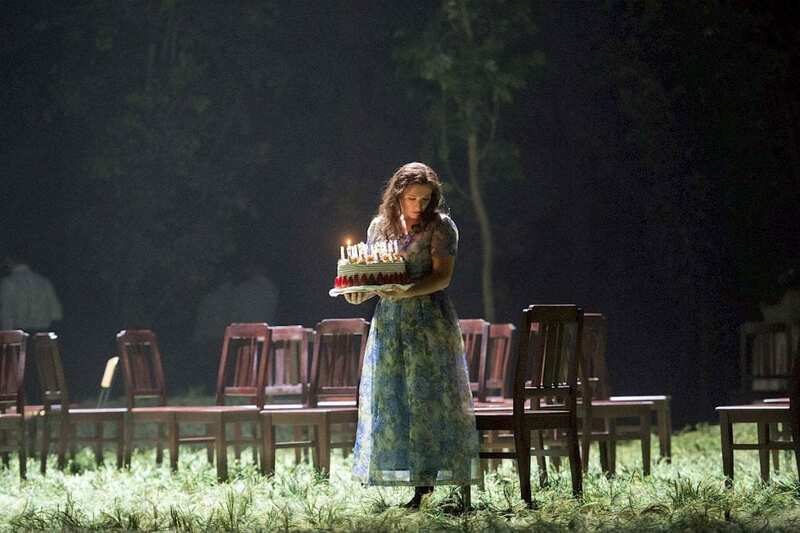 She is unhappy with her boring village life until Jewgeni Onegin (Eugene Onegin) comes into her life. She is fascinated by this man who appears not to be a part of society. In the beginning he uses irony and cynicism when talking with this young girl who is just pure emotion. In the end, Tatjana learns irony and cynicism, and he is just pure emotion. 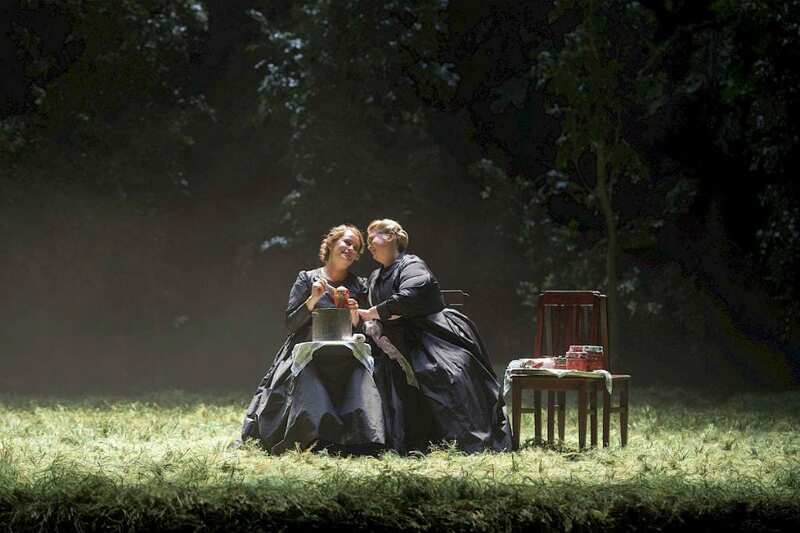 The Zurich Opera engaged no less a figure than accomplished Australian director Barrie Kosky. His challenge is that the audience must be able to identify with the problems the protagonist suffers. The audience must feel bad for Onegin at the end of the opera even though he behaves really badly and is an unsympathetic character. Kosky and his team (phenomenal stage and costume design by Rebecca Ringst and Klaus Bruns) wanted to put the characters in a landscape to show their environment. They set all the action in a meadow surrounded by trees. They showed society in a massive scene but without overshadowing the emotions of the main characters. 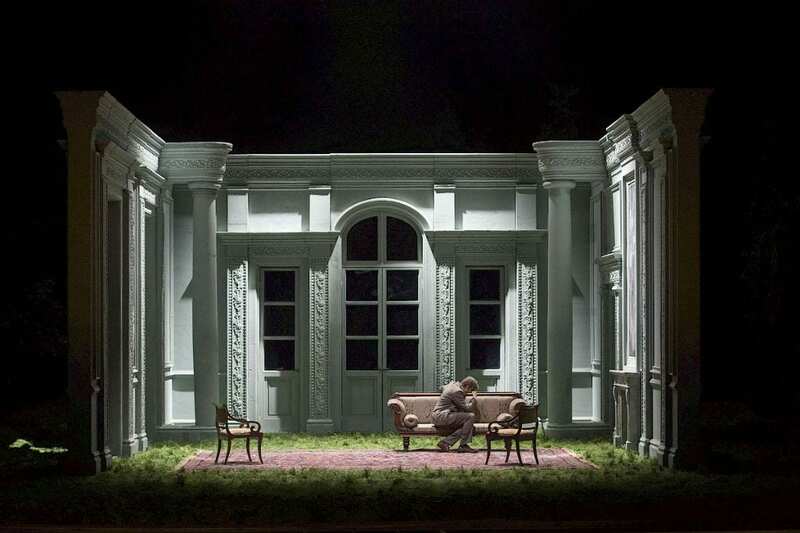 Thanks to his phenomenal personal direction, Kosky manages to take the audience on this emotional journey with the characters, so after three hours, when the opera ends on a huge question mark, you really want to know about the future of all the characters–and that’s what makes great theatre! 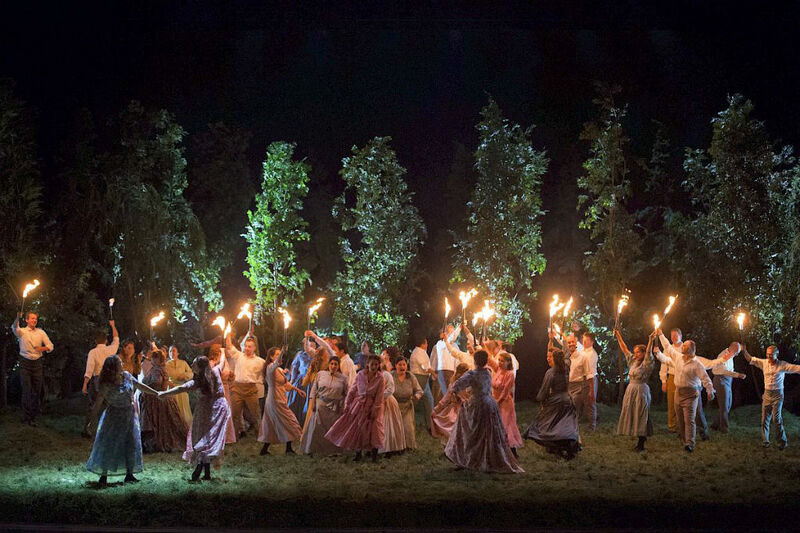 To make it a great opera, however, the musical part is at least as important as the scenic. Finding an ensemble of singers that fit their characters perfectly, that was the enormous challenge facing Zurich Opera. Peter Mattei is the Onegin of our time. It’s very clear why from his first notes. With so little effort Mattei brings so much power and energy to his character. His warm, baritone voice is as stunning as his acting. In Olga Beszmertna we have a Tatjana who is Mattei’s perfect vocal match (although her acting sometimes seems a bit exaggerated). Her enormously rich voice was as stunningly beautiful as the wonderful dress she wore in the third act. The letter scene, where Tatjana confesses her feelings to Onegin, is one of the highlights of the evening thanks to her brilliant pianissimmi– sung while standing with her back to the audience. Remarkable! As Lensky, Pavol Breslik’s voice at first needed some time to warm up. But then he started to show the audience the wide range of vocal colours his tenor comprises. Ksenia Dudnikova sings the lively young sister of Tatjana, Olga. Her powerful depth gives a solid base to the duet with Beszmertna. Liliana Nikiteanu and Margerita Nekrasova sing the always gossiping Larina and Filipjewna. Christoph Fischesser’s dark bass fits the prince Gremin perfectly. What a pity that he only had one aria. It’s rare for a conductor to be greeted with such extended applause after the interval. But considering what Kochanovsky, the Philharmonia Zurich and the rhythmically fantastic choir of the Zurich Opera achieved, it was totally justified. He was born in October 2001 in Zurich, Switzerland. His passion for the opera began at an early age during a performance of Mozarts „Die Zauberflöte“.He is a member of the Zürich Opera Children’s Choir since 2009. He started taking singing lessons with Noemi Nadelmann and she helped him to get some soloist roles like the Sheperd in Tosca, an Appearance in Macbeth or Miles in The Turn of the screw. He worked with conductors like Plàcido Domingo, Nello Santi or Fabio Luisi. 2016 after seven years of practising the piano he started taking lessons at the conservatory in Zurich. He enjoys watching Opera Productions all around the world. For the future he will take more time to write some reviews, but he will still continue singing.